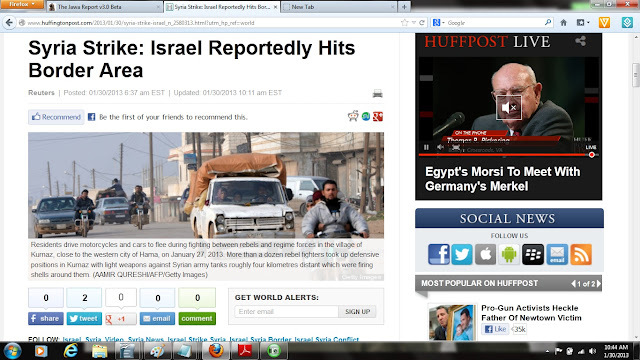 1/31 UPDATE: HuffPost has now doubled-down on its malicious, distorted headline propaganda against Israel. See "Update" at end. 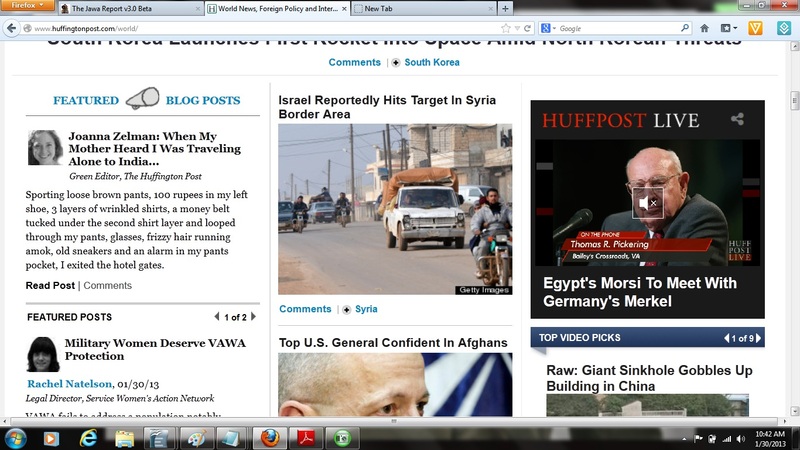 Note: HuffPost is now the world's #1 most-read online "newspaper." For four years, it has been deliberately, maliciously inciting and tolerating hate against Israel and Jews, based on false, unprovable or grossly decontextualized allegations, and biased story choices and positioning (archives here, here). It also attracts nearly 15,000 unique visitors per day from the three incubators of Islamist terror: Pakistan, Saudi Arabia and Egypt (details here). What's the problem, you may ask? In the run-up to the raid, Israeli officials have been warning very publicly of a threat of high-tech anti-aircraft and anti-tank missiles reaching Israel's enemies in the Lebanese militant group Hezbollah from Syria. 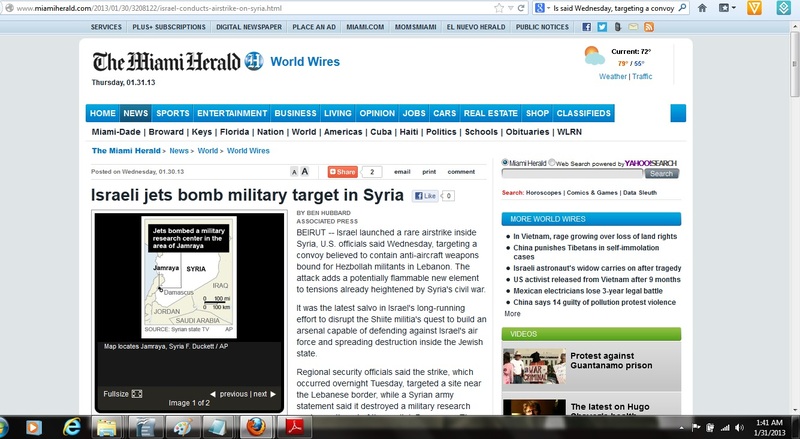 They have also echoed U.S. concerns about Syria's presumed chemical weapons arsenal. Does the picture that HuffPost chose to run with this story depict a "convoy" of presumably military or industrial-type trucks, capable of carrying WMDs, or missiles? So HuffPost knew this was not a photo from the Syria-Lebanon border, which is where the attack took place, and knew that it was taken three days ago --- of civilians trying to flee internal Syrian fighting. 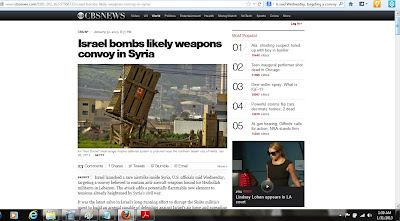 It had nothing whatsoever to do with Israel. Arianna and her army of minions know full well the power of images, and that there's nothing like matching a picture of poor civilians whom it implicitly or explicitly claims --- falsely --- are victims of Israel's marauding, careless, malevolent military. 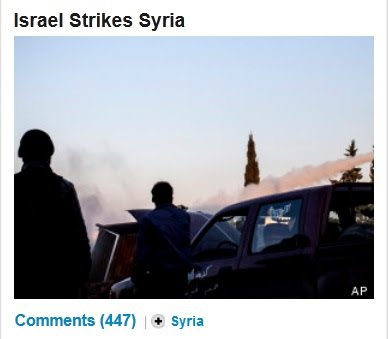 By choosing this picture to match with the headline, and the story, HuffPost has once again does what it specializes in: whipping up hatred against Israel by claiming, explicitly or implicitly, that it is deliberately attacking poor, innocent civilians. Exactly as it has been doing for four years. Further, as we and our friends at HuffPostMonitor have documented repeatedly over the past four years, when Israel retaliates against the terrorists who are deliberately targeting and murdering Jewish civilians, HuffPost invariably engages in "bloody-shirt-waving," featuring gory pictures of Palestinian civilians and children who are accidentally injured or killed. 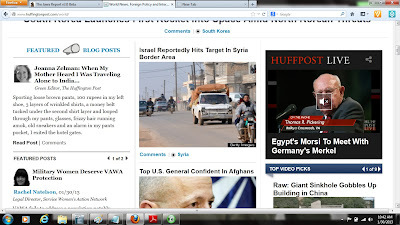 But as HuffPostMonitor has been particularly effective in documenting, when Islamist terrorists murder Jewish civilians in the most savage ways imaginable, well, on those rare occasions when HuffPost even chooses to cover the story, it matches those headlines with pictures of jeeps, of walls, and inanimate objects. Israel is now facing a potential sum of all its fears: Assad giving his stockpile of WMDs --- suspected to be the largest in the world --- to Hezbollah, which has sworn to wipe out the Jewish state. 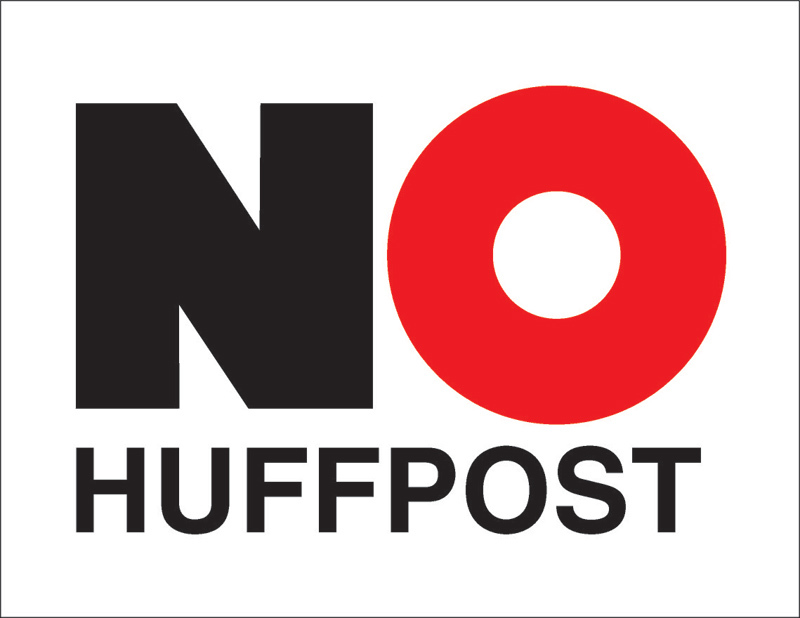 And HuffPost, once again, is willfully, voluntarily publishing "news" stories that whip up hatred --- not against the monsters who target and murder civilians, and are threatening to wipe an entire nation off the map --- but against those who are victimized by them, and who are, in a very real sense, now fighting for their lives. And the punch-line is, your tax dollars are going to enable all this. If you only got your "news" from HuffPost, what would that headline lead you to conclude? 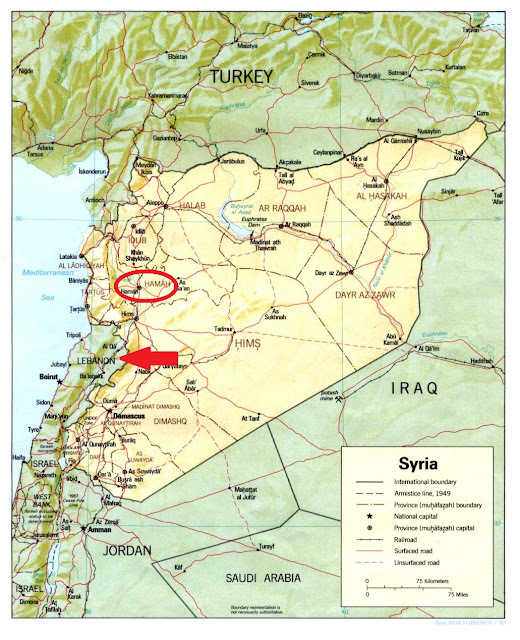 Perhaps that some bored IAF pilots out on a training mission just decided to go do some target practice on Syrian civilians, perhaps? (AP) BEIRUT — Israel launched a rare airstrike inside Syria, U.S. officials said Wednesday, targeting a convoy believed to contain anti-aircraft weapons bound for Hezbollah militants in Lebanon. 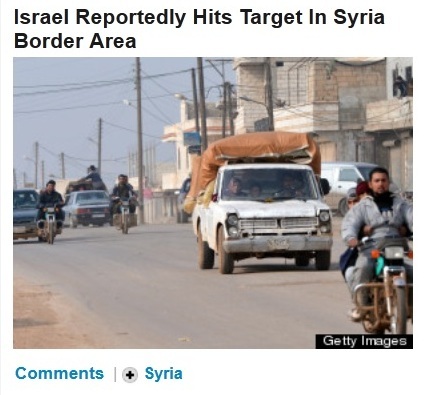 Now take a look at the picture HuffPost chose to match with that headline. What do those civilians have to do with a military attack on a military convoy at the Lebanon border? Nothing, of course --- just as the picture HuffPost used on Jan. 30 had nothing to do with the incident, either. But leave it to Arianna, who claims she's "the future of news," to twist this story, once again, to completely leave out the context of the headline, and to falsely imply, pictorially, that Israel is mercilessly attacking civilians --- just as her "newspaper" has been doing for more than three years. [Huffington] is offended and bewildered by the suggestion that other news outlets think she's getting a free ride. She sees herself as the future of journalism, not the end of it.